Air Science introduces a new line of ductless nanoparticle enclosures marketed as the Purair® NANO series. 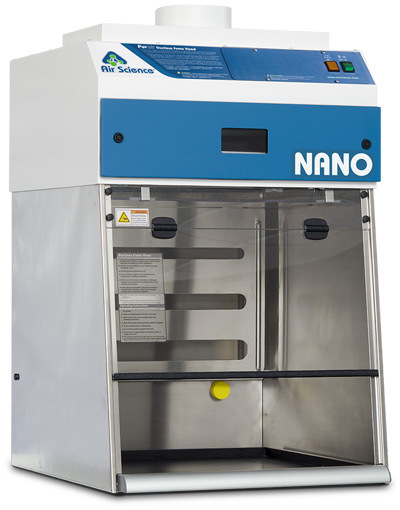 The NANO is manufactured with a stainless steel infrastructure, powder coated FFU, and dual filtration options to ensure superior containment. The Purair NANO incorporates a variety of design features to help enhance operator safety, including the optional SafeSwitch™ Filter Shutter system, innovative filter clamping, and an exhaust canopy that allows for thimble ducting directly to the facility exhaust system. According to Paul Chambre, CEO of Air Science, "As nanotechnology continues to advance in aerospace, research, pharmaceutical, and academia, we wanted to provide an effective containment solution for 100nm and smaller. The Purair NANO is our answer to that need, providing a safe work environment at an affordable price point." The high quality exhaust fans allow the NANO to maintain a constant face velocity of 100FPM in compliance with all USA and international standards for safety and performance. Contaminated air is pulled through Multiplex™ filtration system, which can be fitted with highly effective HEPA or ULPA filters. "We designed the NANO with today's researchers in mind," says Chambre. "We wanted to provide an innovative enclosure that was intuitive, convenient, and above all else, safe." Learn more about the Purair NANO or download product literature here. Air Science also offers a full range of ductless filtration laboratory solutions. For more information, contact us today or visit our product selection page.